Each year, Music For Minors contacts teachers in Lee and Collier counties to nominate deserving students in the music programs at their school. We then interview the students and the parents to determine if they fit the criteria to be awarded an instrument. If they fit the financial and academic criteria, the students are accepted into the program and receive the instrument of their choosing. Each year the students must be re-certified for our program to ensure they continue to meet our requirements. After three years in our program, if the student remains in their music program and maintain good grades in school, the students receive a certificate of ownership for that instrument and the instrument is then theirs to keep for the rest of their lives. To date, Music For Minors Foundation, Inc. has awarded over to 300 instruments to our deserving students! Recently, Music For Minors began awarding private lessons scholarships, as well as the Dorothy Friedenreich Music Scholarship to selected MFM students who decide to either major or minor in music. To date, we have awarded nearly $25,000.00 through these two scholarship funds! Other programs include the Dorothy Friedenreich Music Scholarship, named in honor of the founder of Music For Minors, which we award annually to students who have graduated from our program and continue their music education in college by either majoring or minoring in music in college. We have also established a repair program so that each year, our current students can get their instruments repaired and put back in good playing condition. 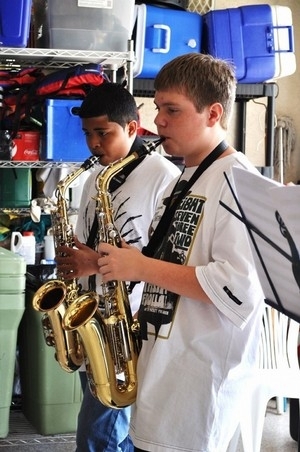 Music For Minors also helped establish the guitar program at the Royal Palm Academy in Naples, FL by provided 14 instruments that had been donated to us.